සොෆ්ට්වෙයාලන්තය|softwarelanthaya arduino sinhala turorial arduino sinhalen arduino පාඩම arduino සිංහලෙන් sinhala arduino ආඩුයිනෝ සිංහල Arduino පාඩම 14 - පින් 3 කින් පින් 8 ක වැඩ. Arduino පාඩම 14 - පින් 3 කින් පින් 8 ක වැඩ. ගොඩ කාලෙකට පස්සේ තමයි arduino ගැන post එකක් ලියන්න පුලුවන් උනේ. මේ පාර පාඩමෙන් මම කතා කරන්න යන්නේ decoders ගැන. decoders කියන්නේ අපි ලබාදෙන bit කියපයක් තවත් bit කිහිපයකට වෙන් කරලා output එකක් ලබාදෙන්න පුලුවන් දෙයකට. උදාහරණයක් විදිහට කිව්වොත් අපිට arduino එකේ pin 3 භාවිතා කරලා වෙන වෙනම LED 8 ක් control කරන්න බැහැ. 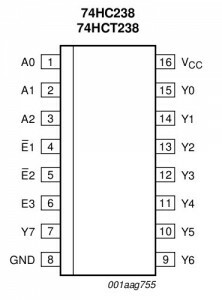 නමුත් decoder එකක් use කලොත් අපිට decoder එකට arduino එකේ pin 3 කින් input ලබාදීලා decoder එකෙන් pin 8 කින් output ගන්න පුලුවන්. තවත් විදියකට කිව්වොත් arduino එකේ pin 3 ක් විතරක් use කරලා වෙන වෙනම LED 8 ක් කොන්ට්‍රොල් කරන්න පුලුවන්. මන් කලින් විස්තර කලේ pin 3 කින් input දීලා pin 8 කින් output ගන්න පුලුවන් decoder එකක් ගැන. මේ වගේ decoder වලට 3 bit to 8 bit decoder කියලා කියනවා. මේ වගේ තවත් decoders වර්ග තියෙනවා. Decoders වැඩ කරන්නේ කොහොමද ? 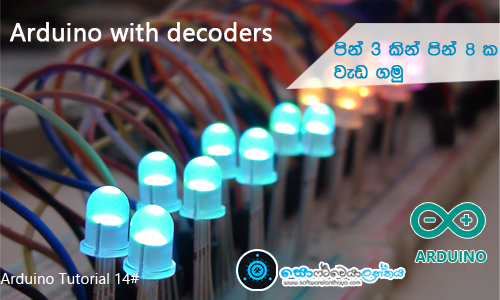 decoders වර්ග කිහිපයක්ම තිබුනත් මේවා හැම එකක්ම වගේ වැඩ කරන්නේ පොදු ආකෘතියකට. මේ ආකෘතිය තේරුම් ගත්තහම ඕනේම decoder එකකින් වැඩ කරන්න පුලුවන්. මන් මෙතන කියලා දෙන්නේ 74HC237 කියන 3 bit to 8 bit decoder එක use කරන්නේ කොහොමද කියලා.74HC238 IC එකත් කිසිම වෙනසක් නැතුව use කරන්න පුලුවන්. IC එක රු. 60-80 ත් අතර ගානකට ලංකාවේ මිලදී ගන්න තියෙනවා. මේ decoder තවත් විශේෂත්වයක් තියෙනවා. ඒ මේ pin 8 න් අපි HIGH කරන පින් එක ඇරුනහම අනිත් pin ඔක්කොම LOW වෙනවා. ඒ කියන්නෙ අපිට වෙලාවකට output ගන්න පුලුවන් එක පින් එකකින් විතරයි. සාමාන්‍ය විදිහට මේ IC එකට GND, VCC pin වලට power එක දෙන්න ඕනේ. සාමාන්‍යයෙන් decoder වැඩ වලදී මේ 4,5 පින් ground කරලා 6 pin එක 5v වලට connect කරනව. උඩ වගුවේ තියෙන්නේ input pin වල voltage level, HIGH සහ LOW කරහම output pin වල voltage වෙනස් වෙන විදිහ. මම මෙතනදී කරන්න යන්නේ push button එකක් ඔබන වාරයක් ගානේ LED එක එක on කරන්න යන්නේ. මේවගේ වැඩක් කරන්න LED 8 කට arduino ouputs 8 ක් ඕනෙ උනත් මම decoder එකක් භාවිතා කරලා arduino ouputs 3 කින් මේක කරලා තියෙන්නේ. setup එකේදී සාමාන්‍ය විදිහට 4,5,6 pin output විදිහටත්, push button එකට හයි කරපු 11 pin එක input විදිහටත් setup කරගෙන තියෙනවා. ඊට පස්සේ මම LEDon කියලා function එකක හදාගෙන තියෙනවා. 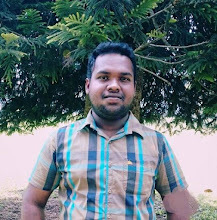 මේක තමයි මෙතන තියෙන වැදගත්ම code කොටස. LEDon කියන function එක call කරන තැන d1,d2,d3 කියන parameters වලට ලබාදෙන අගයන් අනුව 4,5,6 කියන pin වල status වෙනස් වෙනවා. ඒ කියන්නේ pin HIGH ද ? LOW ද ? කියලා තීරණය වෙන්නේ d1,d2,d3 කියන parameters වලට ලබාදෙන අගයන් අනුව. උදාහරණයක් විදිහට LEDon(0,0,0); විදිහට function එක call කලා කියලා හිතමු. එතකොට වෙන්නේ 4,5,6 කියන pin 3 ම low වෙන එක. එතකොට comment එකේ තියෙනවා වගේ පළවෙනි LED එක විතරක් on වෙලා අනිත් LED 7 ම off වෙනවා. LEDon(0,0,1); විදිහට function එක call කලා කියලා හිතමු. එතකොට වෙන්නේ 4,5 කියන pin 2 low වෙලා 6 pin එක high වෙන එක. එතකොට දෙවෙනි LED එක විතරක් on වෙලා අනිත් LED 7 ම off වෙනවා. මේක හරියට වැඩ කරන්නේ truth table එකක් වගේ. මේ විදිහටම තමයි ඕනම decoder එකක් වැඩ කරන්නෙ. ඊට පස්සේ loop එකේදී මුලින්ම බලනවා ll පින් එක high වෙලාද කියලා. 11 pin එක high වෙලා නම් counter කියන variable එකේ අගය 8 ට අසමානද කියලා බලනවා. අසමාන නම් counter කියන variable එකේ දැන් තියෙන අගයට තව එකක් එකතු වෙනවා. variable එකේ අගය 8 ට අසමාන නැත්නම් ඒ කියන්නේ අගය 8 නම්, variable එකේ අගය 1 කරනවා. ඊට පස්සේ case statement එකක් දාලා counter එකේ තියෙන අගය අනුව අදාල LED එක on කරනවා. article එක හොදයි නම් අනිත් අයටත් බලන්න share කරන්න. Great post. These are the things that arduino followers finding. Keep continue because people need this kind of materials.